In honor of Sunday night's Academy Awards ceremony I'd like to thank Hollywood for what it has done for me. These photographs have appeared in a variety of travel guidebooks, magazines and newspapers. Cool! What kind of camera / lens did you use? How come your photographs all come out crisp and clear, while mine are always blurry on the edges, etc. Is there a secret? some cool photos here!! can you tell me what time the actual ceremony starts here in mexico time?? as I want to be back from the wknd to watch it!! I'm with Catherine: Very cool photos! I have a Canon 5D and a variety of the L lenses. For quality the lens is even more important than the body. Better to buy a good used lens and body than a brand new body with a not so great lens. Claps ! Claps ! Claps ! And when I think of Hollywood, having never been there, these are the exact images that come to mind. 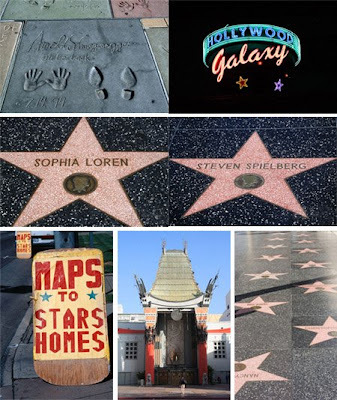 Debo Hobo, these are very classic iconic images of Hollywood Boulevard, ironically a place where people who live in LA never go. Yes, truly classic pictures. Hollywood Blvd will definitely be one of my first stops during my first stay in L.A. - whenever that may be. An thank you for including Sophie Loren. That's a blast from the past. She was born, not too far, from the area of Italy where my parent grew up. What iconic images! I'm with Genaro, the Sophia Loren star made my day. I'm ready for the Oscars now! Erica, I hope you make it to LA one day soon. Gennaro and Fly Girl, If I could be a movie star Sophia Loren would be at the top of my list.